Marietta National Cemetery is a United States National Cemetery located in the city of Marietta in Cobb County, Georgia. It encompasses 23.3 acres (9.4 ha), and as of the end of 2006, had 18,742 interments. It is closed to new interments, and is now maintained by the new Georgia National Cemetery. 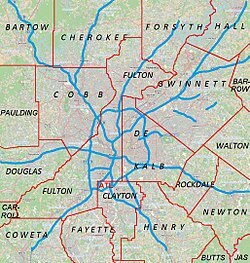 Originally established in 1866 by General George Henry Thomas as Marietta and Atlanta National Cemetery, it was intended to provide interment for nearly 10,000 Union dead from General William Tecumseh Sherman’s Atlanta Campaign. The land for the cemetery was donated by local resident Henry Cole, as a place to inter both Union and Confederate soldiers. His idea was that by burying together those who had fallen together in battle, it could help foster a kind of peace. 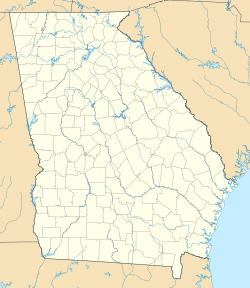 Both sides rejected his proposal, and the land was used primarily to inter Union soldiers, while the others were buried in the Marietta Confederate Cemetery. As part of the land sale agreement, the Cole family has their own plot within the National Cemetery. Marietta National Cemetery was placed on the National Register of Historic Places on September 18, 1998. A marble obelisk dedicated in honor of 20th Army Corps was erected in May 1870. The Wisconsin Monument, dedicated in 1925 to 405 men from Wisconsin who died during the Civil War and were interred at the cemetery. The Gold Star Mothers Monument, dedicated on April 24, 1960. The Pearl Harbor Monument, erected on December 7, 1996. 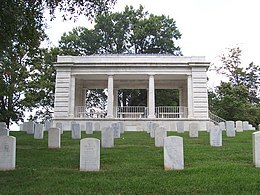 Wikimedia Commons has media related to Marietta National Cemetery.